All maps are made of small cubes. The first complete level of the 1985 super mario bros.
A map of all the mario models i made, cubes/characters/pipes/ etc. 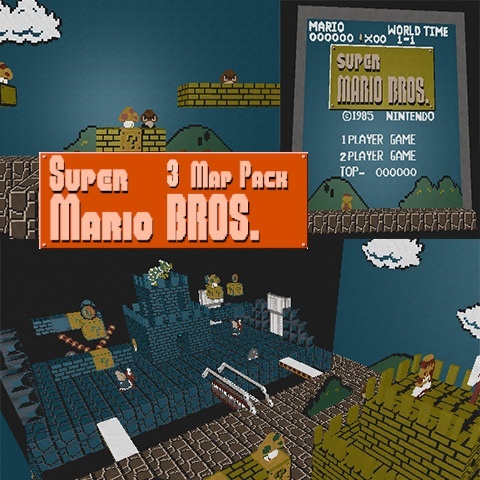 - The theme isn't very original anymore as there are plenty of other maps which carry just the same theme (mario). However, the appearance does look different in this one. - The texturing looks very similar to it's original game, which is a plus point to me (even they all contain a certain specular light). - It was a bad call to notify it as a deathmatch map, as only 1 map actually supports it. Even it is being supported by that map, the flow and gameplay are lacking depth greatly. I can't give much points for this, as it's intended to be playable, yet it isn't (you're not able to continue after jumping over the first death boundary in the map called mario_firstlevel. The map called mario_war has playerstarts and ammunition, but their positions aren't great at all, neither is the flow of that map). Next to that, I've seen better versions which aren't only for showing off. Where are the plenty of other maps with the same theme? The last decent one posted on this site is from jackycola smb back in early 2009. The only other ones I found weren't comparable. Finally, mario_war being your deathmatch map, this is the one my rating will apply to. I'm sure you realized while mapping this, the scale and movements are fundamentally incompatible. This is the same effect as if you were to try and model your own home as a deathmatch map. My suggestion would be to restart it from scratch using your blocks and items as details and not as the meat of the level. Make it a lot larger and don't be afraid to take some creative license with the theme. Sigh, do I really have to justify my opinion? Well, try these contents. Super Mario Pickups (I know, it's not a map, but they fit the theme as well and could be used for other mario-themed maps). As there is a Mario Land 2 content, I'm sure a Mario land content existsed also (yet it has been removed or lost, as a link is being provided on the Mario Land 2 content). That brings us to at least 6 contents which carry the very same theme or a very similar theme. It doesn't require that much skill as you needed back in the old days, as nowadays there are scripts which are able to generate such images perfectly (so it's way easier and faster as if you would make them all manually). It's something which I haven't stated in my previous comment, yet considered about it. If you have no idea where am I talking about, try the next couple of links. In theory, if you have a picture of the entire map (like here) you could generate the entire map in just seconds. Only configuring before generating would take some minutes, but that's all. Practically, it will take a little longer due the fact you can't load an image with a bigger resolution as 2048x2048 in Sauerbraten, but you could just make screenshots from marioland on an emulator for the pc and use those to generate all fragments. So it probably takes about 2 hours to create this content (as you also have to make it appear as 3D, which is just a matter of copy-paste). Stating all this, this map is actually in conflict with the 10 Sauer Commandments, as it can be seen as a gimmick map and as taking less than 12 hours to make. Just because it might be theoretically possible to do something in less than 12 hours doesn't mean it was done in less than 12 hours and also doesn't mean everyone can do it in 12 hours. I'd bet even you can't do what you just explained until tomorrow noon, suicizer. No because I have more things to do (my very own projects need to be finished, several events in real life, etc). I'll see if I got time to try out.